A lathe (/leɪð/) is a machine that rotates a workpiece about an axis of rotation to perform various operations such as cutting, sanding, knurling, drilling, deformation, facing, and turning, with tools that are applied to the workpiece to create an object with symmetry about that axis. The lathe is an ancient tool, with tenuous evidence for its existence at a Mycenaean Greek site, dating back as far as the 13th or 14th century BC. Clear evidence of turned artifacts have been found from the 6th century BC: fragments of a wooden bowl in an Etruscan tomb in Northern Italy as well as two flat wooden dishes with decorative turned rims from modern Turkey. The first known painting showing a lathe dates to the 3rd century BC in ancient Egypt. The lathe was very important to the Industrial Revolution. It is known as the mother of machine tools, as it was the first machine tool that led to the invention of other machine tools. The first fully documented, all-metal slide rest lathe was invented by Jacques de Vaucanson around 1751. It was described in the Encyclopédie. An important early lathe in the UK was the horizontal boring machine that was installed in 1772 in the Royal Arsenal in Woolwich. It was horse-powered and allowed for the production of much more accurate and stronger cannon used with success in the American Revolutionary War in the late 18th century. One of the key characteristics of this machine was that the workpiece was turning as opposed to the tool, making it technically a lathe. 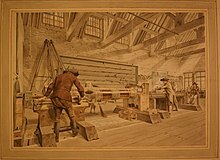 Henry Maudslay who later developed many improvements to the lathe worked at the Royal Arsenal from 1783 being exposed to this machine in the Verbruggen workshop. A detailed description of Vaucanson's lathe was published decades before Maudslay perfected his version. It is likely that Maudslay was not aware of Vaucanson's work, since his first versions of the slide rest had many errors that were not present in the Vaucanson lathe. Smaller metalworking lathes that are larger than jewelers' lathes and can sit on a bench or table, but offer such features as tool holders and a screw-cutting gear train are called hobby lathes, and larger versions, "bench lathes" - this term also commonly applied to a special type of high-precision lathe used by toolmakers for one-off jobs. Even larger lathes offering similar features for producing or modifying individual parts are called "engine lathes". 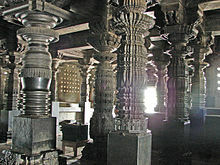 Lathes of these types do not have additional integral features for repetitive production, but rather are used for individual part production or modification as the primary role. 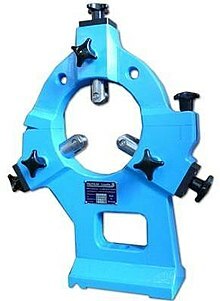 A lathe with a tool post that can rotate around a vertical axis, so as to present different tools towards the headstock (and the workpiece) are turret lathes. National and international standards are used to standardize the definitions, environmental requirements, and test methods used for the performance evaluation of lathes. Election of the standard to be used is an agreement between the supplier and the user and has some significance in the design of the lathe. In the United States, ASME has developed the B5.57 Standard entitled "Methods for Performance Evaluation of Computer Numerically Controlled Lathes and Turning Centers", which establishes requirements and methods for specifying and testing the performance of CNC lathes and turning centers. ^ a b "What is a wood lathe & How to use it?". ^ Clifford, Brian. "A brief history of woodturning". The Woodturner's Workshop. Woodturners' Guild of Ontario. Retrieved 2018-07-24. The earliest piece from that [Northern Italy] was found at a site known as the "Tomb of the Warrior" at Corneto. This is a fragment of a wooden bowl, dated at around 700 BC, which shows "clear evidence of rounding and polishing on its outer surface and of hollow turning..." (Woodbury) Other Etruscan turned vessels were found on this site. ... Excavations of a mound grave in Asia Minor (now Turkey) revealed two flat wooden dishes with decorative turned rims. These have been dated as from the 7th century BC. ^ Emperor's Ghost Army (documentary). PBS. Event occurs at 26:00. Archived from the original on 2016-01-15. ^ Clifford, Brian. "A brief history of woodturning". The Woodturner's Workshop. Woodturners' Guild of Ontario. Retrieved 2018-07-24. The earliest information on the lathe dates from the 3rd century BC. This is a bas-relief carving on the wall of the grave of an Egyptian called Petrosiris. ^ Tomiyama, Testuo (2016-02-16). "Development of Production Technology and Machine Tools (presentation notes)" (PDF). OpenCourseWare: TUDelft. TUDelft. pp. 18–21. Archived (PDF) from the original on 2018-07-25. Retrieved 2018-07-24. 1770 Jan Verbruggen Escaped to England with his Son Pieter Verbruggen (1734-1786) and Became Master Founder at Woolwich Arsenal Tomiyama, Testuo (2011). 02. Ontwikkeling Fabricagetechnologie [02. Development of Manufacturing Technology] (Lecture). Delft, Netherlands: TUDelft. ^ Ruttan, Howard. "Wait a minute..." Archived from the original on 2009-01-08. ^ "Hints & Tips for Using a Lathe". “George Wilson’s” Hints and Tips - Publication date unknown. Lathes.co.uk. Archived from the original on 1 December 2010. Retrieved 29 November 2010. ^ Griffiths, Tony. "Makers of "Bench Precision" Lathes". LATHES.CO.UK. Archived from the original on 27 December 2017. Retrieved 5 February 2018. ^ Parker, Dana T. Building Victory: Aircraft Manufacturing in the Los Angeles Area in World War II, p. 81, 123, Cypress, CA, 2013. ISBN 978-0-9897906-0-4. ^ Smith, Merritt Roe (2015). Harpers Ferry Armory and the New Technology: The Challenge of Change. Cornell University Press. ISBN 9780801454394. Retrieved 30 June 2016. ^ "Methods for Performance Evaluation of Computer Numerically Controlled Lathes and Turning Centers". asme.org. The American Society of Mechanical Engineers. Archived from the original on 7 November 2017. Retrieved 5 February 2018. 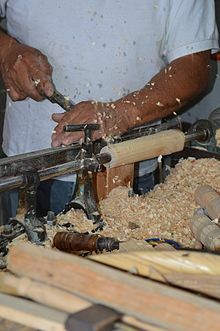 Wikimedia Commons has media related to Lathes. The history of the lathe at Archive.today (archived 2012-12-23). Additional archives: 2016-12-01.